Gone are the days when [insert glorious memory from the past]. Whether that’s annoying or not, it’s often the case today, especially in sport. Especially in Formula 1. This insanely exhilarating kind of motor racing used to be about the extraordinary personalities, now it’s so obviously not. There simply aren’t any interesting characters left, and if there are, we cage them by not letting them act in a way that would excite us. There is something we can do to change that though. I think it was the British comedian Sean Lock who stated that watching Formula 1 for him is like turning on two washing machines and seeing which one finishes washing the clothes first. Now, this is a dagger to any petrol-blooded heart yet it’s a creatively constructed joke and, I must say, the racing fans deserve it. We only have ourselves to blame if we’re bored, and the lack of personalities in Formula 1 is kind of our fault anyway. If we carry on like this, soon we’ll have technologically perfect washing machines driving themselves on a racing circuit. Actually, this personality problem is by far not a unique thing of Formula 1, it’s just highly evident here. Tennis, for example, has Novak Djokovic, who’s an artistic circus performer on the inside, but in his own words, “puts a serious game face on” when the time comes. Now why would someone do a thing like that, knowing that being interesting would guarantee more fans? The answer is simple – there’s just too much risk. However, that wasn’t a problem for tennis talents like John Mcenroe or Vitas Gerulaitis. Nor was it an obstacle for Formula 1 drivers of the past, who literally could have died every time they sat in the car, so the only thing they were really afraid of was not being true to their own character. No matter how cheesy that may sound today, it was a crucial part of a racer’s integrity back then, and the spectators could feel it. You’d lose fans if you weren’t interesting. Remember Nigel Mansell being accused of being boring? Just imagine if tomorrow someone of key importance would publicly state that a certain celebrity sportsman is as interesting as an insurance policy – what would be your reaction? We’ve turned racers into drivers, and it’s about time we let them be themselves again. It’s also very evident in boxing, if we’re on the subject of other sports. “The fight of the century”! It was a perfect sum up of the whole problem – the superfight on the 2nd of May was unable to live up to even the 10% of the hype. What we could see was one of the most overpaid boxers of all time, desperately trying to look like a legend. And he had to fight an even more overpaid and more desperate Floyd Mayweather! Stop and take this fact into account – the most interesting man in football right now is Mario Balotelli. Why? Well, because he’s acting like an idiot. And if acting like an idiot makes you the most interesting man in football, something is either wrong with football or the fans. No one is saying that a sport celebrity should snort Santa’s powder, party wildly, travel from one court hearing to another, beat the mailman up or be the class clown. There were times when the whole world was watching famous sports people drink coffee and fans were satisfied by that. Charisma, that’s what that was. Individuals like James Hunt had it in their veins and it was no mystery to anyone. James used to argue with the best restaurants of the world to let his dog eat there; he threw up before almost every race, and refused to ever wear a tie or a nice suit, often showing up at important events barefoot. The main issue here is this: James wasn’t TRYING to be interesting, he was interesting just being himself, by letting his charisma run free. Movies like “Rush” (2013) are still merely movies, however most things in that film did actually happen! 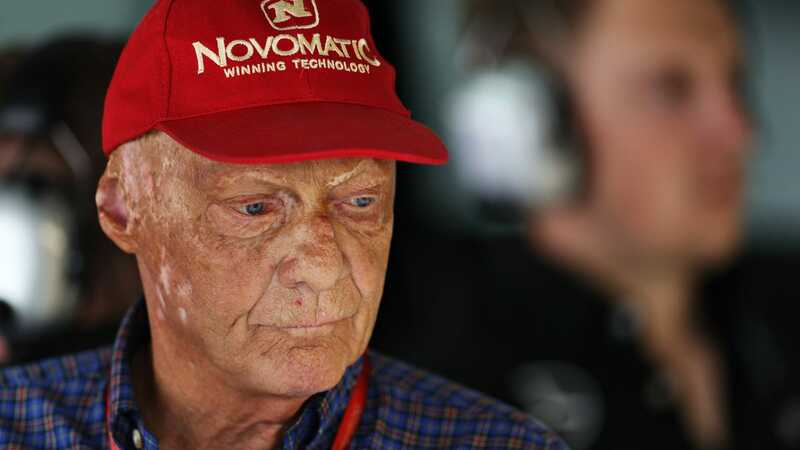 Niki Lauda’s impressive face is the best proof of that, also of the amazing, intense and captivating atmosphere the drivers had back in those days. 1) The sport is obviously not challenging enough, and if you’re never doing anything challenging, you can’t possibly excite millions of people. 2) Money! Sponsors! Contracts! This is stopping the flow of charisma. A top driver can’t behave in a way as if he doesn’t care about what his actions may do to the sponsorship deals. No freedom of choice means no charm. 3) Most modern sportsmen are conventional family men with a steady sport performance and an even steadier character, living on “training-race-home” mode. And that’s great, there’s absolutely nothing wrong with that, but the fans definitely need a contrast, a certain opposition. And what would that be? Cocky, stupid, flashy, egocentric wannabe-legends, who are mostly interesting for themselves and their mothers. Everyone knows that Formula 1 should be engaged in social media more, but what’s there to socialise about, really? Nothing interesting ever happens. It’s such a shame that we now have these magnificently inventive platforms and there is never something exciting going on. We had a recent chance to change things by embracing the idea of a female role model in the sport, but the public still can’t wrap their heads around why Susie Wolff didn’t get the seat when Valtteri Bottas injured himself at the beginning of the 2015 season. This could’ve become that very needed breath of fresh air. If a current driver would do something out of the ordinary, a giant storm of angry Tweets and blog posts would read “he can’t do that”! Of course he can, HIS ONLY JOB IS TO RACE! He shouldn’t be a good example for kids, he definitely shouldn’t be a successful product of marketing, nor should he ever try to become “F1’s Next Top Model” (I’m sure a project like that is on the way). Why wasn’t anyone so angry with Amy Winehouse when she did all those drugs, got into various fights, or talked absolute trash at press conferences? Because when Amy got on stage, she was brilliant, and that’s what matters. So why can’t we let racers be racers? We’ve turned racers into drivers, and it’s about time we let them be themselves again. Imagine the amount of attention and the ginormous number of new fans Formula 1 would get if there was at least one new racer who was… interesting. And he (or she) wouldn’t have to do anything spectacular at first, let’s begin by not starting every interview answer with “I’m very much looking forward to the race” and not ending every public announcement with “I was training hard and I did my best”. For this to happen, the general public and the media professionals in Formula 1 have to be looking for interesting people, and we seem to only want more noise from the cars. All we can hope for today is a Formula 1 driver being media-friendly, that’s the maximum. It’s proving to be not enough, and there might be no other way to stop the growing isolation of the sport than finding new ways to use our platforms wisely. Yes, we need to have solid content in order to use those platforms to the fullest, but we have to be ready for that content, and most importantly, we have to show that this is the type of content we really need. It’s not that difficult to fix Formula 1. All it requires is a bit more curiosity from our side, and a few crazy people behind the wheel of a car. British Grand Prix - Thursday 2nd July 2015. Silverstone, England.